Rio Grande’s Eduardo Zurita (left) was named the River States Conference Offensive Player of the Year and the overall Player of the Year, while Jorge Guinovart (right) was named the league’s Defensive Player of the Year on Friday night. NEW ALBANY, Ind. 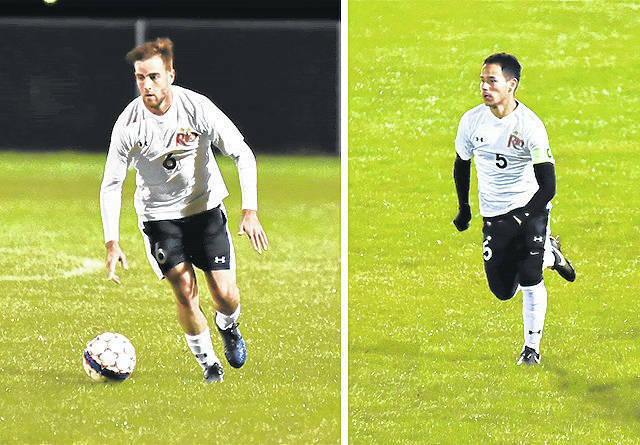 — The University of Rio Grande dominated the 2017 River States Conference Men’s Soccer All-Conference Teams and Awards announced Friday night by league officials. Rio Grande (14-1-1, 8-0-1 RSC) had junior midfielder Eduardo Zurita take home two individual awards as the RSC Player of the Year overall and also the RSC Offensive Player of the Year. A native of Sant Boi De Llobregat, Spain, Zurita has a team-high 12 goals and 28 points to rank among the conference leaders. He also notched four assists. Rio Grande also had the RSC Defensive Player of the Year with senior defender Jorge Guinovart, a native of Barcelona, Spain. Last year’s RSC Men’s Soccer Player of the Year and RSC Male Athlete of the Year, he came back from an injury earlier in this year to anchor a RedStorm defense that has given up just 14 goals in 16 games. Rio Grande’s Scott Morrissey has claimed another RSC Coach of the Year honor this year by leading his team to an unbeaten conference regular season. In his 29th season, Morrissey has led the RedStorm to a top-5 NAIA ranking all season long, the NAIA runner-up position last year and the NAIA national championship in 2015. RSC Newcomer of the Year honors went to IU East’s Dumi Kunwenda, a sophomore defender from Malawi. He is a transfer from LSU-Alexandria who started 17 games for the first-year Red Wolves, and he earned the honor as the top vote-getter in the all-conference selections who is new to the conference. Fourteen players were named to the All-RSC first team and 14 to the All-RSC second team through balloting of the league’s coaches. A Champions of Character Team was also selected. Rio Grande led the list of First Team honorees with five players selected. Joining Zurita and Guinovart on the first team were sophomore defender James Williamson (San Jose, Costa Rica) and junior forwards Spencer Reinford (McAlisterville, PA) and Omar Walcott (Kingston, Jamaica). Midway (Ky.) University, which finished second in the conference standings, was next with three players on the first team led by defender Harry Kirwan, midfielder Brad Wilson and goalkeeper Christian Neira. Asbury (Ky.) University and Point Park (Pa.) University had two players each on the first team with the Eagles represented by defender Austin Baker and midfielder Ryan Metcalf and the Pioneers having their two forwards Alan Ramos and Roberto Whitley named. WVU Tech and Cincinnati Christian had one player each on the first team with midfielder Francisco Neto (WVU Tech) and goalkeeper Bryan McDowell (CCU), respectively. WVU Tech led the way on the second team with four selections. The other 10 second-teamers came from six different teams with Rio Grande, Midway, Point Park and IU East with two each and one each from Asbury and Cincinnati Christian. Rio Grande’s second team selections were sophomore midfielder Deri Corfe (Chester, England) and junior midfielder Harry Reilly (Coventry, England). The RSC Men’s Soccer Champions of Character Team selected one player from each school who best exemplifies the five core character values of the NAIA’s Champions of Character Initiative, which are respect, responsibility, integrity, servant leadership and sportsmanship. Williamson was Rio’s Champions of Character honoree.